Â Jason Dorsey, Generation Y expert and author of My Reality Check Bounced, is one of the twenty-something age leaders featured in the new book Millennial Leaders: Success Stories from Today’s Most Brilliant Generation Y Leaders. Dorsey appeared recently on the CBS 60 Minutes episode The “Millennials” Are Coming. Southern Pines, NC (PRWEB) November 15, 2007 — In the new book, Millennial Leaders: Success Stories from Today’s Most Brilliant Generation Y Leaders (http://MillennialLeaders.com), the co-authors and executive coaches, Bea Fields, Scott Wilder, Jim Bunch and Rob Newbold feature interviews with 25 of the most successful Generation Y Leaders of tomorrow who are already leading today. Jason Dorsey, Generation Y expert and author of My Reality Check Bounced, is one of the twenty-something age leaders featured in the book. Dorsey appeared recently on the CBS 60 Minutes episode The “Millennials” Are Coming. Natural entrepreneurs, members of Generation Y are just now making an impact in business and in the culture at large. In addition, as the first group to grow up immersed in media culture, they have a distinctive way of ordering their lives. 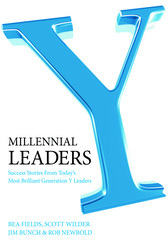 Millennial Leaders brings readers a unique, close up look at the people responsible for the cutting edge of social and business trends. “The leaders of Generation Y are our future, and it is time to start working with them — not resisting their efforts,” said Fields.